If you haven’t already taken a look at our most recent report, now is your chance to get some insight before you download it and dive in. Profiles of Monopoly: Big Cable and Telecom, written by our Hannah Trostle, recently left ILSR to attend grad school, and Christopher Mitchell, transforms FCC Form 477 data into a series of maps that reveal a sad state of competition in the U.S. broadband market. For episode 317 of the podcast, Hannah and Christopher discuss the report and the main findings. Hannah and Christopher provide more insight into the main findings of the report, which analyzes where competition exists and where large national providers fail to invest. The result ultimately creates densely populated areas with more competition for broadband (as defined by the FCC) than rural areas. Due to their de facto monopolies, the top national providers capture huge segments of the population. Hannah and Christopher also talk about the quality of the Form 477 data and the need for better benchmarks, we learn about why Hannah and Christopher felt that it was time to take the data and turn it into a visual story. You’ll learn more about their methodology in developing the maps and their analysis. Hannah, who created the maps that make the foundation of the report, shares some of the surprises she discovered. The two talk about the Connect America Fund and the policies behind the program and how the results have aggravated lack of broadband in rural America and how cooperatives are picking up the slack where big corporate ISPs are failing rural America. If you want to learn more about how cooperatives are running circles around the big ISPs in rural areas, download our 2017 report, Cooperatives Fiberize Rural America: A Trusted Model for the Internet Era. For years, national cable and telecom companies have complained that they work in a tough industry because “there’s too much broadband competition.” Such a subjective statement has created confusion among subscribers, policy makers, and elected officials. Many people, especially those in rural areas, have little or no choice. We wanted to dive deeper into the realities of their claim, so we decided to look at the data and map out what the large carriers offer and where they offer it. In order to share our findings with policy makers, local elected officials, and the general public, we’ve created a report that includes series of maps to illustrate our findings and our analysis, Profiles of Monopoly: Big Cable and Telecom. Whether it’s a brand of breakfast cereal, a model of car, or an Internet Service Provider (ISP), those who purchase a good or service know that when they have more options, the options they have are better. The FCC defines "broadband" as connectivity that provides speeds of at least 25 Megabits per second (Mbps) download and 3 Mbps upload; our report fouces on service where ISPs claim to offer this minimum threshold. When it comes to ISPs, subscribers often have a faux choice between unequal services, such as one telephone company offering slow DSL and one cable company that offers faster cable Internet access. People in rural America often have even slimmer options because cable ISPs don’t provide broadband in less populated rural areas. In other words, the market has spoken and the market is broken. The Rocky Mountains are beautiful, but they make Internet access difficult -- that’s the long and short of our research on Colorado. 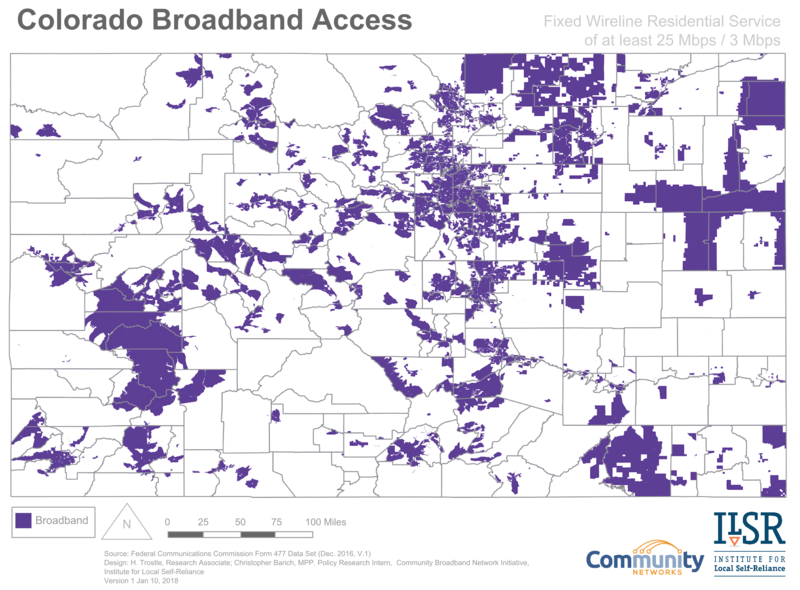 While community networks are making some headway in providing much needed connectivity, much of the state still may only have access to fixed wireless or Satellite service. 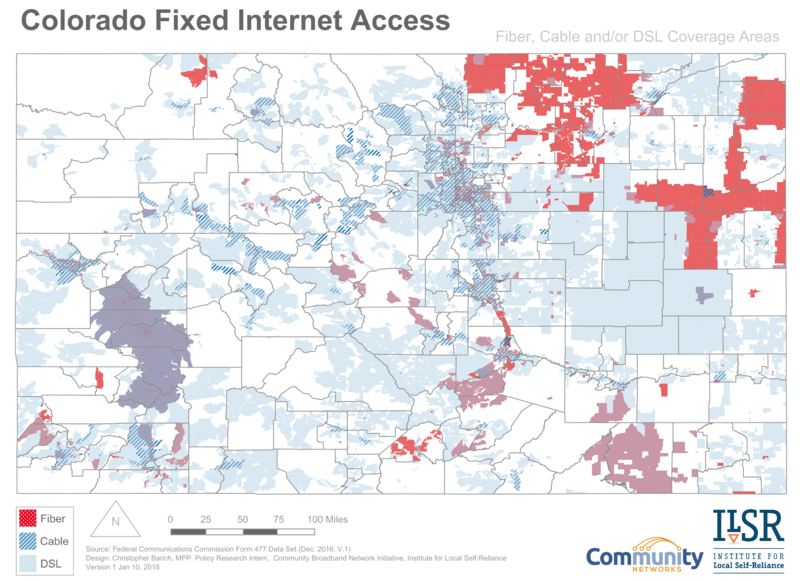 We investigated Internet access in Colorado using the Federal Communication Commission's (FCC) Form 477 data. Many of the most rural areas of the state do not have any form of Internet access other than satellite or fixed wireless services. For our analysis, we exclusively looked into wireline Internet service because it is less weather-dependent than satellite or fixed wireless. We added county subdivisions onto our map to help readers differentiate between more urban and predominantly rural areas. That map, however, shows only Internet service availability across the state; it does not show broadband service. The FCC redefined broadband as 25 Mbps download and 3 Mbps upload in 2015. Earlier definitions of broadband included speeds as low as 4 Mbps download and 1 Mbps upload. DSL service, while widely available, often cannot support this latest definition of broadband. It relies on copper telephone lines, and the actual speeds customers experience are often not as fast as advertised, "up to" speeds. Cable can provide broadband speed, but its actual speed can vary in times of peak traffic, such as the early evening. Fiber is the most reliable form of Internet service. In some communities, fiber networks are providing speeds of 10 Gbps (400 times the speed of broadband).